Beautiful, condo with magnificent ocean views. Custom furnished by interior designer, PRIVATE hi-speed wireless Internet, advanced surround sound audio visual component system, soft-close kitchen cabinet doors, under cabinet lighting in kitchen, upgraded faucets throughout, indoor & outdoor pools, fitness center, lazy river, indoor and outdoor pools & children's water park. Condo has a fully equipped kitchen, over-sized balcony overlooking pools, food court, kid's water park, hot tub and of course, the ocean. Balcony is accessed via the family room and master bedroom. There are HDTV's with DVDs in each room of the Condo with Blu-Ray DVD for the wall mounted extra large HDTV in family room. The surround sound has in-wall speakers. The Condo has a washer and dryer, interior off-street parking, food bar servicing pool & building. Scores of golfing, restaurants, water parks, shopping, theaters, & water based activities. Relax in the tranquil surroundings of North Myrtle Beach. Enjoy the sparkling indoor & outdoor pools, spas, lazy river & water playground. The mini grill & bar is a perfect place for a snack, meal or drink while sitting by the pool enjoying the warm breeze & so much more. Golf: There are numerous golf courses in the Myrtle Beach area of world renown. A number of them are PGA sanctioned. Of course there are a good number of miniature golf / putt-putt golf courses around. Live Entertainment: There are many places throughout the grand strand that offer plays and live music. Water Sports: Excellent Board Sailing, parasailing, boating, deep sea fishing, pier fishing and surf fishing. Many inlets offer fishing also. Stop by any of the marinas to charter, rent or ride a boat, go fishing, para sailing sailboarding and much more. Retired from White House. I like to stay busy with projects at the condo or my residence. Spend a lot of time exercising, running, camping and reading the Word. This property is very special. We looked a very long time and were delighted when we came across this property as it was being build. One of the many ways that it stands out from all of the others is that it was designed for people. The other resorts in the grand strand area that are wall to wall condos with hallways that look like a corn maze. The TBGR, in contrast only has condos on the perimeter of the building. This leaves the entire center OPEN. The ceiling is mostly glass which allows the sunlight to filter down through the open architecture floors to the flowers on the lower level. There are only 220 condos in this fifteen story Mediterranean styled building. It is beautiful outside and in with defining details. I would do it all over again. Rent my condo here and you will have the best of both. Lovely tiled floors and granite countertops with new decorative faucets and hardwood flooring. Classic Southern warm water beach with nearby fishing pier, water sports for para sailing, surfing, tubing-banana boats, wind sailing, etc. From resort to ocean's edge is approximately 50 yards. The resort has interior secured parking so you always enter a cooled car. You step from one of the four high speed elevators and into your vehicle. There is wired and wireless internet in this wonderful condo and resort. Towels are ONLY for condo use and cannot be taken to pool or beach. We have 5.1 surround sound for TV; Set top Cable box. It is Blu-Tooth enabled so you can play your personal favorites from your phone, PC, Notebook or other Blu-Tooth enabled device. There is a public tennis court adjacent to the resort. Bring racquets and balls and have fun. Amenities The resort has a poolside grill that has wait staff serving the pool area in season. The grill is open year round. The resort has indoor and outdoor pools, hot tubs, sauna, lazy river, kid’s water play area exercise room Bicycle Rack A feature I like is the off-street parking. Park inside the building’s secure garage and step from your car to the elevator. Tennis and basketball courts next to the building. Area Activities Movie theaters Restaurants Miniature golfing Shopping Live entertainment Scores of other activities. Myrtle Beach area is renowned for golfing. Grocery stores within 2 blocks. The House of Blues is nearby. You can see plays, hear live music and enjoy exciting dinners here. Next to the House of Blues is great shopping, people watching and eateries, at Barefoot Landing. Alabama Theater is nearby and is another great place for live entertainment. Fireworks each Friday @ Barefoot Landing! We enjoyed another October stay at Cherry Grove. Relaxed, watched the beautiful ocean on the deck, made new memories to always remember. The condo is so nice and clean everything you need of course. All the updating was really nice too. Thanks to Rocco and Miriam for such a beautiful place to come too. Lucky two weeks with gorgeous weather and just 2 down days due to Micheal. Our condo is lovely with all the amenities one would need. The balcony view of the beach is lovely & we spent many evenings there.The beach access is across the street, perfectly close for walking to .The three bedrooms & baths offer spacious accommodations for guests. We like to walk daily, so even onhot & rainy days, we walked inside on 5-9th floors. We have booked for next October. A few things to know: BIKE WEEK is the first week in October : it was busy & loud. The Tilghman is family oriented, so expect to share the hot tub with children. Felt like home walking in.. comfort and waiting for adventure! The condo is spacious, comfortable with a beautiful view of the ocean. Full with all the amenities needed for a great stay. Rocco was easy and a pleasure to rent from. Thank you for another great family vacation! You were SUCH a pleasure working with. I have been blessed with kind and wonderful guests over the years. Many of them return year after year ... another blessing. We are so glad that you selected one of our condos from the zillion available to you. You were as easy and pleasant to work with, fun even :- )). This was a beautiful and clean unit with an incredible view! Breakfast on the balcony was breathtaking, although I do wish the table could be a little larger for those of us who fix a hearty breakfast. We loved the view from the couch, as well! Rocco was wonderful to work with and helped guide us through the whole vacation rental process. It was great to have not only three bedrooms, but three bathrooms as well. The condo is decorated very pretty and the flooring is nice, and we liked the fact that there was no carpet. Ladies, you may need to take a makeup mirror for the master bathroom. We loved the Tilghman property with ample parking and the fast, air conditioned elevators!! The staff is very nice and courteous. There is no problem crossing the road, and there is a button to push for crossing, so the drivers are very courteous to stop. It is a wonderful beach area, and it's not too busy! We can't thank Rocco enough for allowing us to stay in his wonderful condo! We are already planning a trip for next year, and hope we will be fortunate enough to stay at his condo again! Thank you for the kind words. I hope you will be pleased to know that we are here looking for just that, a larger balcony table. The other work were are here for is DEEP cleaning, pulling and replacing silicone everywhere, baseboards, scrubbing walls and floors, etc. We love hearing that the condo was super clean and well furnished. We will always strive towards those ends. The balcony and tile are being cleaned Monday. Hoping for the new kitchen appliances to be delivered soon. The property was clean, nice and exactly as advertised. The condo was exactly as advertised. So many times we have booked a place based on pictures and descriptions only to find when we get there the pictures were taken years prior and no longer an accurate representation of the property. It was clean and beautifully decorated. The amenities were wonderful and the front desk staff was polite and helpful. While we did not take advantage of the kids club offerings we thought it was awesome how they were handled. The proximity to the beach front was wonderful! Overall we would recommend this specific rental to friends and family for future stays. Thank you for not adding any rental stress to our stay! Thank you for your review. 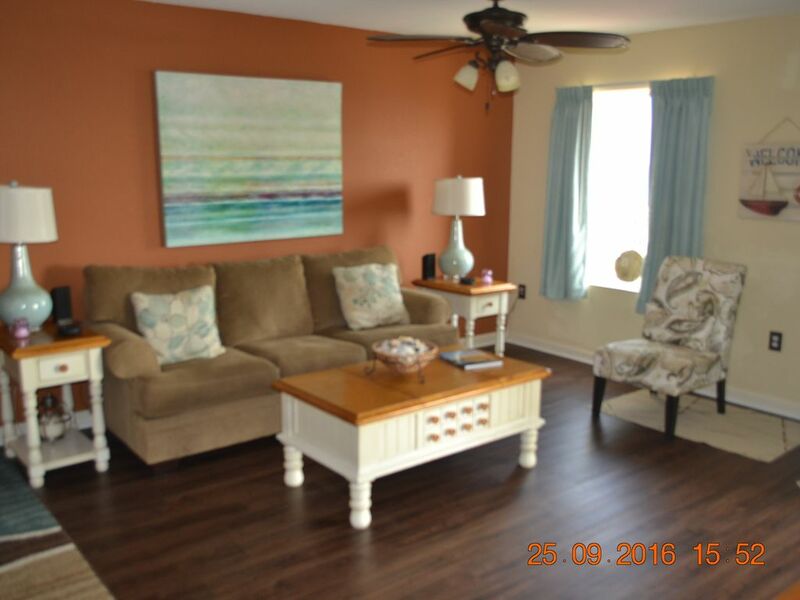 We are very happy our beach home met your needs and expectations. We strive to ensure well furnished and immaculately cleaned condos for our guest. Best place to stay by far!!! We have stayed at this condo a couple times and it never disappoints! It is our absolute favorite place to stay! Beautiful and the cleanest condo you could stay at! I love all of the amenities and my family can’t wait to go back! Rocco is so helpful and is so great to work with! You will love this place! You are always great to work with. We hope you'll like the upcoming new SS slate colored kitchen appliances about to be installed on a future trip. This resort provides a perfectly balanced location near many of Myrtle Beach's world famous golf resorts, restaurants, shopping, music and live theater and is directly across from a quiet stretch of ocean. Some activities available nearby in addition to those above are bicycling, shopping, dining out, para sailing, boating, charter & surf fishing, miniature golfing, sailing, wind surfing, . lakes, art, music, festivals and much much more. The resort has several pools, inside and out, multiple hot tubs, sauna, tennis court next door and a non-cement water-based play area so no more scuffed knees and elbows! For those who love to unwind while fishing there is very good surf fishing and there is a fishing pier a few short blocks up the beach. Other Activities: Minutes from many area attractions such as Barefoot Landing, Tanger Outlets, Alligator Adventure, Miniature Golf, pier fishing, House of Blues and world famous North Mrytle Beach nightlife. A perfect spot for family fun, romantic getaways, golf or relaxation. And of course all things water based, pier fishing, boating, spas and so much more are right here.